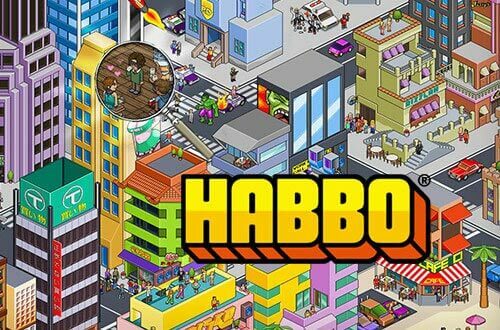 Habbo Hotel is one of the world’s biggest social networks, where you can create your own customized character and meet people. As easy as that. You only need to register for free, no need to download or install anything, just customize your avatar and conquer the world. You’ll have your own hotel room, ready to be customized however you want, completely for free. When you’re done with your customization, go out to the streets and make friends. You’ll be able to play online with people from all over the world, go to parties, listen to music and become famous. Everything you wish for, at a single click. If you read everything and you’re still not sure what you’re getting into, there’s only one option left: play now! A picture’s worth a thousand words, so, even if we tell you about everything you’ll find, you’ll only know for sure if you enter and try this incredible social MMO. Different characters, Friends, chatrooms, parties, virtual mascots, celebrities, music, concerts, decoration, games, challenges, leisure activities… the list goes on and on. This game will make you have more fun than you’ve ever had. So what? Are you coming along on Habbo? Because I’m going right now, there’s a party at the hotel! : Intel / ATI Radeon X850, 256 MB or better. DirectX 9.0 or higher. : nVIDIA GeForce 6800 / ATI Radeon X850, 256 MB or better. DirectX 9.0 or higher.